The “war on drugs” has some valuable lessons to teach the San Francisco Department of Building Inspection (DBI) which is charged with protecting tenants against predatory landlords. It’s long past time for DBI to apply the same attitude–and methods–toward slumlords. DBI should become not merely a law-enforcing agency but a revenue-creating one. And those revenues should come from predatory slumlords who routinely violate the City’s laws protecting tenants. The slumlord would be told he could reclaim 75-80% of the money onlyif he fully corrected the violation within 30 days. The remaining portion of the levied fine would go into the City coffers, to be shared among DBI and other City agencies. If the landlord failed to comply with the actions ordered within 30 days, the entire fine would go into the City’s coffers–to be dividedamong DBI and other agencies charged with protecting San Francisco residents. In addition, he would be hit again with a fine that’s at least twice the amount of the first one. Inspectors for DBI should be allowed to cite landlords for violations that fall under the jurisdiction of the Department of Public Health. They can then pass the information on to DPH for its own investigation. If DPH objects to this, DBI should propose that DPH’s own Inspectorsbe armed with similar cross-jurisdictional authority. Each agency would thus have increased motivation for spotting and correcting health/safety violations that threaten the lives of San Francisco residents. In May, 2012, Italian police arrested them and deported them back to America a year later. In my next column I will lay out how this can be done. Only then was he apprehended by Secret Service agents. Gonzalez’ short-lived trespass onto White House grounds was one of 143 security breaches–or attempted breaches–at facilities protected by the United States Secret Service (USSS) during during the last 10 years. Yet not all is well in Presidential security. “Morale is down, attrition is up, misconduct continues and security breaches persist,” Rep. Jason Chaffetz, (R-Utah) publicly stated. But the blunt truth is that many of the problems now plaguing the USSS were on full display as early as 2009. That was when well-known investigative reporter Ronald Kessler published his then-latest book, In the President’s Secret Service. Salaries paid to USSS agents have not kept pace with reality. Veteran USSS men and women are now being offered up to four times their salary for moving to the private sector, and many are leaving the agency for that reason. USSS agents are being trained with weapons that are outdated (such as the MP5, developed in the 1960s) compared to those used by other law enforcement agencies and the potential assassins they face (such as the M4–with greater range and armor-piercing capabilities). Congressional members who visit the agency’s Rowley Training Center in Laurel, Maryland, are treated to rehearsed scenarios of how the agency would deal with attacks. If agents were allowed to perform these exercises without rehearsals, Congressional members would see they make mistakes like anyone else. The United States Secret Service (USSS) is “in crisis”–a crisis that threatens President Barack Obama and his successors as President of the United States. That’s the verdict of a review of the House Oversight and Government Reform Committee. Since April, 2012, the agency has faced scandal–and scrutiny by the press and Committee. That was when reports first surfaced of agents buying the favors of prostitutes in Columbia. Even more embarrassing for the USSS were a series of security breaches that potentially exposed President Barack Obama to danger. As a result, during the last three years, three directors have headed the Secret Service. Numerous agents–including senior officials–have been disciplined, transferred or fired. For decades, the Secret Service was seen by the press, public and other law enforcement agencies as an elite agency. And the Presidential Protection Detail (PPD) was seen as the most elite part of the agency. The agency is understaffed and overworked. Its staffing crisis started in 2011 owing to government-wide budget cuts demanded by Republicans. The Secret Service has fewer employees today than it did in 2014, despite recommendations from an independent panel that staffing be increased. There have been a number of undisclosed security breaches–such as in October, 2014, when an unauthorized woman gained access to a Congressional Hispanic Caucus event that Obama attended. In February, two people gained access to the outer security perimeter of the White House. There have been 143 security breaches–or attempted breaches–during the last 10 years at facilities protected by the agency. “This report reveals that the Secret Service is in crisis,” Rep. Jason Chaffetz, (R-Utah) publicly stated. “Morale is down, attrition is up, misconduct continues and security breaches persist. But the truth is that many of the problems now plaguing the U.S. Secret Service were on display long before the House issued its report. Not so Steven Pressfield, who repeatedly holds up the past as a mirror to our present. 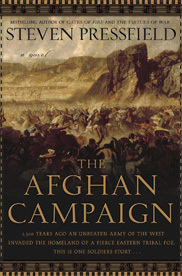 Case in point: His 2006 novel, The Afghan Campaign. By 2006, Americans had been fighting in Afghanistan for five years. And today, almost ten years into the same war, there remains no clear end in sight–to our victory or withdrawal. Pressfield’s novel, although set 2,000 years into the past, has much to teach us about what are soldiers are facing today in that same alien, unforgiving land. Matthias, a young Greek seeking glory and opportunity, joins the army of Alexander the Great. But the Persian Empire has fallen, and the days of conventional, set-piece battles–where you can easily tell friend from foe–are over. Alexander next plans to conquer India, but first he must pacify its gateway–Afghanistan. Here that the Macedonians meet a new–and deadly–kind of enemy. Matthias learns this early. In his first raid on an Afghan village, he’s ordered to execute a helpless prisoner. When he hesitates, he’s brutalized until he strikes out with his sword–and botches the job. But, soon, exposed to an unending series of atrocities–committed by himself and his comrades, as well as the enemy–he finds himself transformed. And he hates it. He agonizes over the gap between the ideals he embraced when he became a soldier–and the brutalities that have drained him of everything but a grim determination to survive at any cost. Pressfield, a former Marine himself, repeatedly contrasts how civilians see war as a kind of “glorious” child’s-play with how soldiers actually experience it. He creates an extraordinary exchange between Costas, an ancient-world version of a CNN war correspondent, and Lucas, a soldier whose morality is outraged at how Costas and his ilk routinely prettify the indescribable. And we know the truth of this exchange immediately. For we know there are doubtless brutalities inflicted by our troops on the enemy–and atrocities inflicted by the enemy upon them–that never make the headlines, let alone the TV cameras. We also know that, decades from now, thousands of our former soldiers will carry horrific memories to their graves. These memories will remain sealed from public view, allowing their fellow but unblooded Americans to sleep peacefully, unaware of the terrible price that others have paid on their behalf. Like the Macedonians (who call themselves “Macks”), our own soldiers find themselves serving in an all-but-forgotten land among a populace whose values could not be more alien from our own if they came from Mars. Put conversely: One lives, we all live. Pressfield has reached into the past to reveal fundamental truths about the present that most of us could probably not accept if contained in a modern-day memoir. These truths take on an immediate poignancy owing to our own current war in Afghanistan. But they will remain just as relevant decades from now, when our now-young soldiers are old and retired. This book has been described as a sequel to Pressfield’s The Virtues of War: A Novel of Alexander the Great, which appeared in 2004. But it isn’t. Virtues showcased the brilliant and luminous (if increasingly dark and explosive) personality of Alexander the Great, whose Bush-like, good-vs.-evil rhetoric inspired men to hurl themselves into countless battles on his behalf. But Afghan thrusts us directly into the flesh-and-blood realities created by that rhetoric: The horrors of men traumatized by an often unseen but always menacing enemy, and the horrors they must inflict in return if they are to survive in a hostile and alien world. Two years later, it’s Donald Trump who has claimed center-stage in “defending” Christmas. And the target of his ire? Starbucks. In years past, its disposable coffee cups have featured snowflakes, winter scenes, reindeer and Christmas ornaments. But this year, Starbucks decided to go with a minimalist, all-red design, its only feature being the company’s green and white logo. This has angered some religious conservatives, who generally care more about symbols than substance. It’s the old “war on Christmas” mantra all over again. And Trump–who hopes to win evangelical votes in Iowa and South Carolina–is happy to become its biggest cheerleader. “Did you read about Starbucks? No more Merry Christmas on Starbucks. In 2013, the American retail industry generated over three trillion dollars during the Christmas holidays. American consumers expected to spend about $704 on average on Christmas gifts. Jesus never commanded his followers to celebrate his birth–but he did call on them to remember his death. This was celebrated from December 17-25. Vladimir Putin admires Donald Trump. And Donald Trump admires Vladimir Putin. Ironically, it is Obama–not Trump–who has repeatedly been named in Gallup polls as the most admired man in America in each of the last seven years, beginning with 2008, the year he was elected president. Although Trump didn’t mention former President George W. Bush, his insult applies–unintentionally but accurately–to Obama’s predecessor. Of course, no one from the Right–including Trump–is now recalling such embarrasing words. And that those tensions will vanish once another Rightist–and non-black–President enters the White House. Donald Trump and Vladimir Putin have been getting a lot of publicity lately–for how much they admire each other. On the surface, this might seem surprising. Putin spent most of his adult life as a fervent member of the Communist Party, which swore eternal warfare against capitalism. After joining the KGB in 1975, he served as one of its officers for 16 years, eventually rising to the level of Lieutenant Colonel. In 1991, he retired to enter politics in his native St. Petersburg (formerly Leningrad). This, in turn, brought him to the attention of Russian President Boris Yeltsin, who groomed Putin as his successor. When Yeltsin unexpectedly resigned on December 31, 1999, Putin became Acting President. In 2000, he was elected President in his own right, despite widespread accusations of vote-rigging. He won re-election in 2004, but could not run for a third term in 2008 because of constitutionally-mandated term limits. So Putin ran his handpicked successor, Dimitry Medvedev, as president. 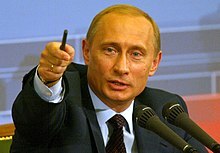 When Medvedev won, he appointed Putin as prime minister. In 2012, Putin again ran for president and won. The Trump Organization sponsors the Miss Universe, Miss USA and Miss Teen USA pageants. He is notorious for stamping “Trump” on everything he acquires, most notably Trump Tower, a 58-story skyscraper at 725 Fifth Avenue in New York City. On June 16, he declared himself a candidate for the Presidency in the 2016 election. Since July, he has consistently been the front-runner in public opinion polls for the Republican Party nomination. Absolute dictators like Vladimir Putin and would-be dictators like Donald Trump often gravitate toward each other. At least temporarily. On January 30, 1933, anti-Communist Adolf Hitler became Chancellor of Germany. For the next six years, the Nazi press hurled insults at the Soviet Union. And the Soviet press hurled insults at Nazi Germany. Then, on August 23, 1939, Hitler’s foreign minister, Joachim von Ribbentrop, signed the Treaty of Non-aggression between Nazi Germany and the Union of Soviet Socialist Republics (U.S.S.R). Signing for the Soviet Union was its own foreign minister, Vyachelsav Molotov. The reason: Hitler planned to invade Poland on September 1. He needed to neutralize the military might of the U.S.S.R. And only Soviet dictator Joseph Stalin could do that. Democratic nations like France, Great Britain and the United States were stunned. But there had long been a grudging respect between the two brutal dictators. He should have brutally purged the officer corps of the Wehrmacht, as Stalin had that of the Red Army. Stalin’s purges had cleaned “deadwood” from the Russian ranks, and a purge of the German army would have done the same. It’s the sort of sentiment that both Vladimir Putin and Donald Trump can appreciate. Freddie Gray’s tally of arrests came to at least 18. But on April 12, he was arrested for what would be the final time. 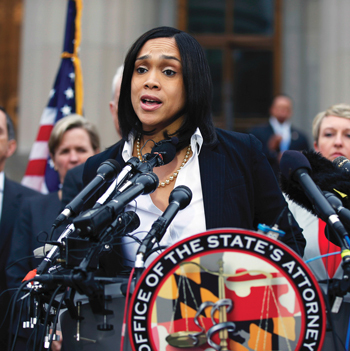 That arrest would lead to Gray’s death and scandal for the Baltimore Police Department. “The manner of death deemed homicide by the Maryland Medical Examiner is believed to be the result of a fatal injury that occurred while Mr. Gray was unrestrained by a seatbelt in custody of the Baltimore Police Department wagon. Officer Caesar Goodson Jr., 45: Second-degree depraved murder, manslaughter, second-degree assault, two counts of vehicular manslaughter charges and misconduct in office. Officer William Porter, 25: Involuntary manslaughter, second-degree assault and misconduct in office. Brian Rice, 41: Involuntary manslaughter, two counts of second-degree assault, two counts of misconduct in office and false imprisonment. Officer Edward Nero, 29: Two counts of second-degree assault, two counts of misconduct in office and false imprisonment. Officer Garrett Miller, 26: Two counts of second-degree assault, two counts of misconduct in office and one false imprisonment charge. Alicia White, 30: Involuntary manslaughter, second-degree assault and misconduct in office. On December 16, Baltimore City Circuit Court Judge Barry Williams declared a mistrial in the trial of William Porter, the first of the six Baltimore police officers charged in Gray’s death. For 16 hours, the jury had deliberated on whether Porter was guilty of involuntary manslaughter. After jurors reported they were deadlocked on all charges, Judge Williams said an administrative judge would set a new trial date as early as December 17. The Freddie Gray case has polarized Baltimore–and America. On the Left–and especially among blacks–are those who believe Gray was an innocent victim of police oppression. On the Right are those who steadfastly defend all police actions, including the most brutal and lawless. Until the anti-drug laws are repealed, they are legal and will continue to be enforced. Freddie Gray knew this better than most. But police who employ illegal methods to enforce the law risk losing not only the cases they want to bring but their own careers as well. They also invite contempt and hatred for their own police agencies and law enforcement in general. Such officers who cause death or injury by unjustified brutality and/or negligence must be held accountable. That has long been considered the difference between the FBI and the KGB. There is a difference between supporting the legal actions of police—and living in a police state. America’s citizens have the right to expect protection from crime–whether committed by civilian criminals or those wearing police uniforms. His criminal record was one of drug charges and minor crimes. He was involved in 20 criminal court cases–five were still active at the time of his death. In February 2009, he was sentenced to four years in prison for two counts of drug possession with intent to deliver and was paroled in 2011–after serving only two. In 2012, he was arrested for violating parole but was not sent back to prison. In 2013, he returned to prison for a month before being released again. He was due in court on a drug possession charge on April 24. He was Freddie Gray, the 25-year-old black man who spent seven days in a coma after he suffered injuries while in the custody of Baltimore police. His last arrest came on April 12. While being transported in a police van to the police station, Gray fell into a coma and was taken to a trauma center. He died on April 19, owing to a broken neck. On April 21, the six Baltimore police officers involved in his arrest were temporarily suspended with pay while an investigation occurred. On April 12, at 8:39 A.M. Lieutenant Brian W. Rice, Officer Edward Nero, and Officer Garrett E. Miller were patrolling on bicycles and “made eye contact” with Gray. According to Miller, Gray, “unprovoked upon noticing police presence,” fled on foot. After a brief foot chase, he was caught and arrested “without the use of force or incident,” according to Miller. A witness to Gray’s arrest have since stated that the police were “folding” Gray. That is: One officer was bending Gray’s legs backwards, while another was pressing a knee into Gray’s neck. A second witness claimed to have seen Gray being beaten with police batons. He also admitted that his officers had failed to buckle Gray in the van–standard police procedure–before he was transported to the police station. News reports have raised the possibility that Gray was treated to a “rough ride”–where a handcuffed prisoner is placed without a seatbelt in a vehicle deliberately driven over rough roads at high speed as an unofficial punishment. And Gray had clearly had enough run-ins with the law to be known to police as a habitual criminal. But even worse findings were to come for the officers involved. On May 2, the Baltimore Sun broke the story that, of the six policemen involved with Gray’s arrest, Brian Rice—the highest ranking officer—had seven guns confiscated by sheriff’s deputies in April, 2012. He had also been temporarily removed from duty–over concerns about his mental health. But that was merely embarrassing. What happened on May 1 was life-changing.